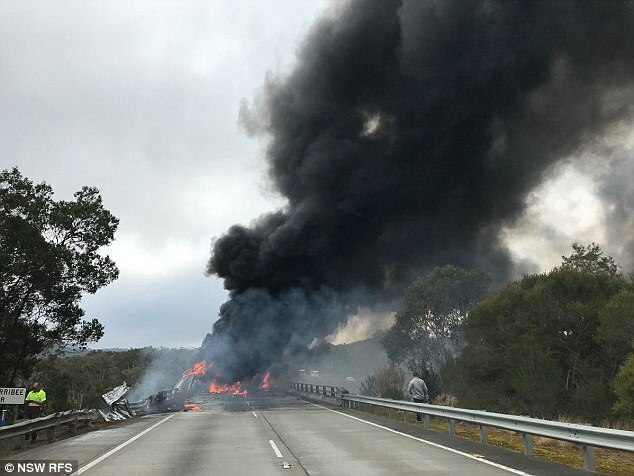 A B-double truck has exploded into flames after ramming into a guard rail and falling off a bridge along the Hume Highway in the NSW Southern Highlands. The busy highway has been closed in both directions as at least nine fire crews worked to extinguish a grass fire sparked by the crash. The accident happened around 8.30am Wednesday on the Wingecarribee Bridge near Berrima, and drivers are being diverted from the crash scene. The grass fire started after burning debris from the truck fell to the ground below, while the truck driver escaped serious injury, RFS Inspector Ben Shepherd said. Extraordinary footage of the inferno was posted to social media by a commuter passing by the crash in the moments immediately after the truck burst into flames. The driver, who is aged in his 60s, reportedly managed to climb out of the smashed cabin of his truck before the fire broke out. He was treated at the scene for minor injuries by paramedics and then taken to Bowral District Hospital in a stable condition. The truck, which was carrying frozen goods, was completely destroyed.